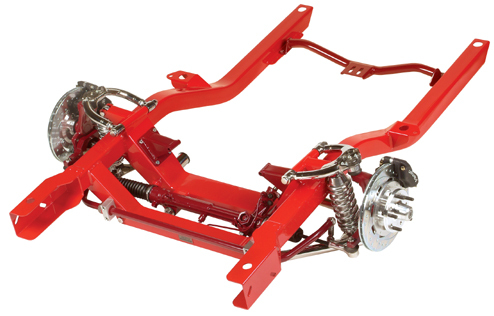 1967-69 Camaro Front Subframe shown with options. 1967-69 Camaro Front Subframe comes unpainted. 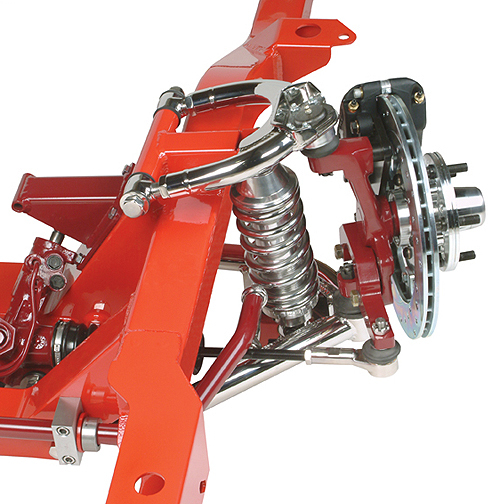 CPP has done it again, releasing its new 1967-69 Camaro Front Subframe featuring their new Pro-G Front Suspension. This state of the art suspension was designed specifically for this new subframe which bolts directly in place with no floor modifications. This is not just another warmed-over or adapted street rod suspension kit, but it is truly a new system, designed for absolute handling and performance, with true race car geometry and characteristics. CF-101 includes: Plain 1-1/4 Upper and 1-1/2 lower Tubular arms, CPPs Billet Adjustable Coil-Overs, 11 brakes with black calipers, Tall Dropped Spindles, and manual Rack & Pinion are included. Options include Trans Crossmember, Polished Stainless Control Arms, Polished Billet Coil-Overs, 12 and 13 Disc Brakes, power Rack & Pinion, and Front Sway Bar. Kits fit 1964-72 Chevelle/ El Camino, 1967-69 Camaro and 1968-74 Nova. These kits work with DISC brake spindles, CPP Modular Drop spindles and Heidts Pro-G drop spindles. Note: These kits require a minimum 17 wheel. &COPY; Classic Performance Products. This "website" and all contents are property of Classic Performance Products. Prices subject to change without notice. Not responsible for errors or omissions.